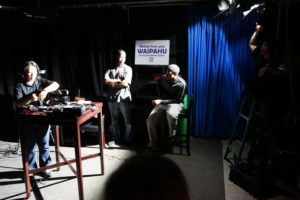 On June 28, 2017, the Waipahu Community Media Center hosted a Lighting & Audio Workshop and Kahea. 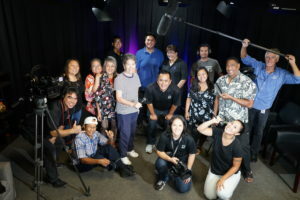 Dedicated producers and volunteers experienced hands-on mentoring from Community Media Associates William Nakao and Justin Kuwamura. 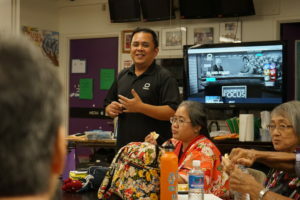 Waipahu CMC Manager Neal Rivera then moderated the kahea with ono food and topical company updates. 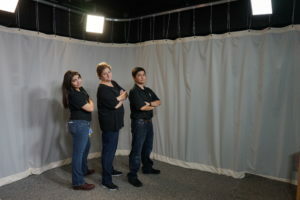 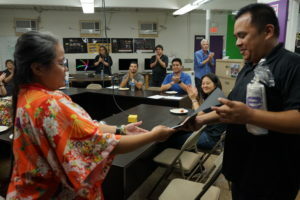 He also presented Michiko Lacar and Wendy Koga with certificates for completing their Basic Media Production training. 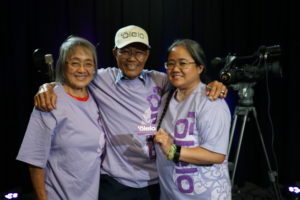 The night wrapped with a handful of the volunteers sporting exclusive apparel as part of the ‘Ōlelo Ambassador program. 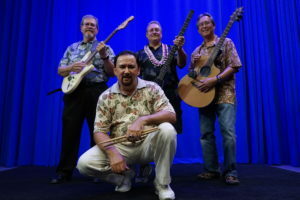 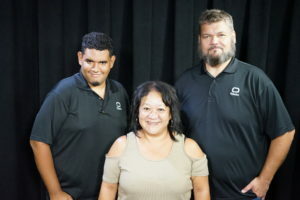 Mahalo to CMC manager Neal Rivera and Community Media Associates Justin Kuwamura and William Nakao. 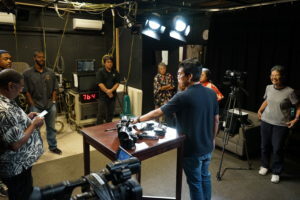 For more information on the Waipahu Community Media Center, call (808) 671-3950 or email us. 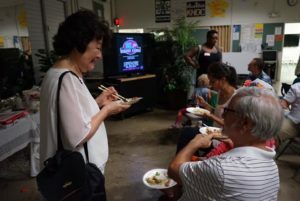 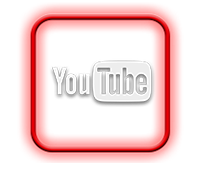 The Kaimukī Community Media Center hosted a well-attended Summer Kahea on June 29, 2017. 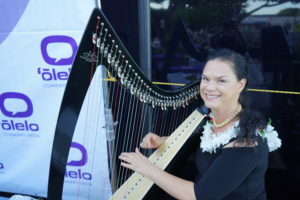 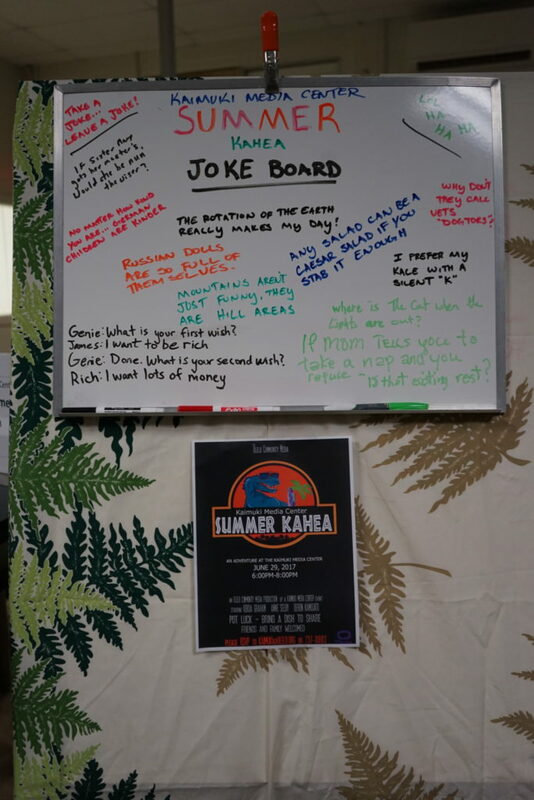 On top of the delicious food, company announcements, and networking, volunteers and producers were given the opportunity to contribute to a community joke board as well as to become pledges for ‘Ōlelo’s Ambassador program designed to spread more awareness of ‘Ōlelo’s services throughout the community. 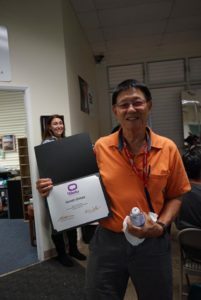 To top it off, 6 newly certified producers who completed the Basic Production Class at Kaimukī received their certificates at the Kahea. 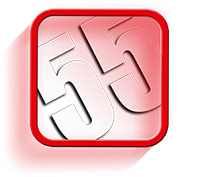 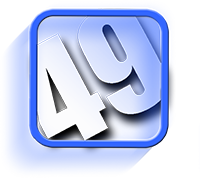 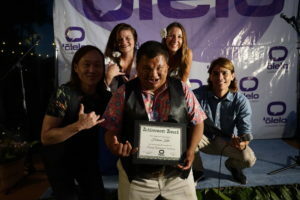 Congratulations to the following producers: Susan Loui, Chris Peterson, Ronen Zilbermann, Erica McMillian, Kenneth Shimata, and Kelly Nakamura. 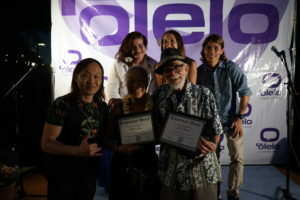 Mahalo to CMC manager Kekoa Graham and Community Media Associates Anne Selby and Deron Kamisato for organizing this event. 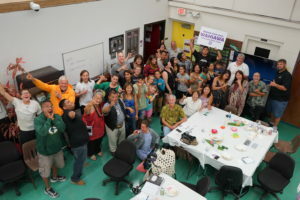 For more information on the Kaimukī Community Media Center, please called (808) 737-8802 or email us. 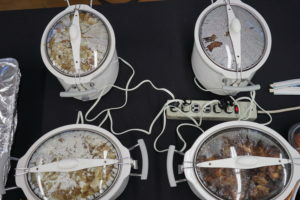 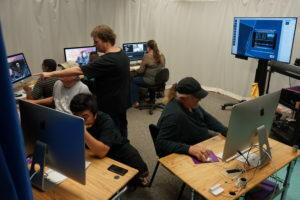 On July 11, 2017, the Kāneʻohe Comminuty Media Center engaged clients with a FCPX Color Correction workshop followed by an onolicious homemade feast (kalua pork, shoyu chicken, and plantation iced tea)! 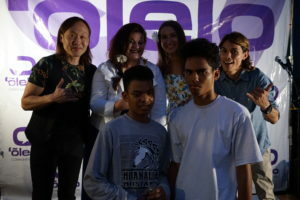 They were even treated to a special guest appearance by former Community Media Associate Mana Franquez! 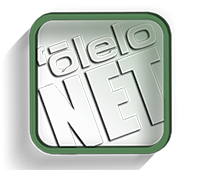 At dinner, clients engaged with each other and were introduced to the ‘Ōlelo Ambassador program. 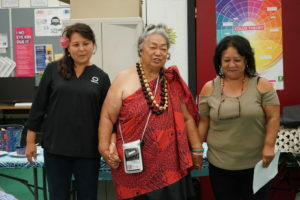 Mahalo to CMC manager Donna Ylen and Community Media Associates Brandee Lima and Alex Miyamoto for organizing this event. 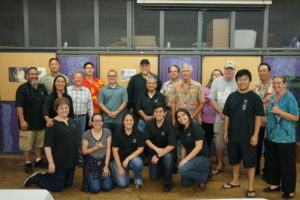 For more information on the Kāneʻohe CMC, call (808) 236-1463 or email us. 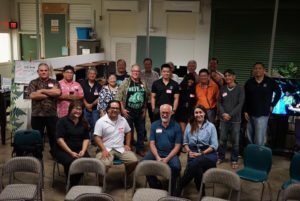 Big turnout at the Wahiawa Community Media Center Kahea on August 3, 2017! 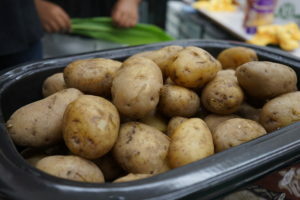 Following the taping of some PSAs for the non-profit organizations ALEA Bridge and North Shore Community Land Trust, the staff opened up a potato bar for dinner! 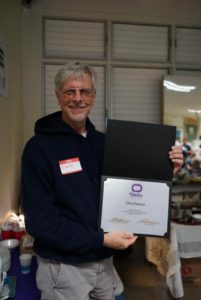 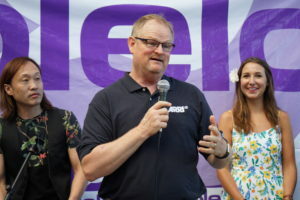 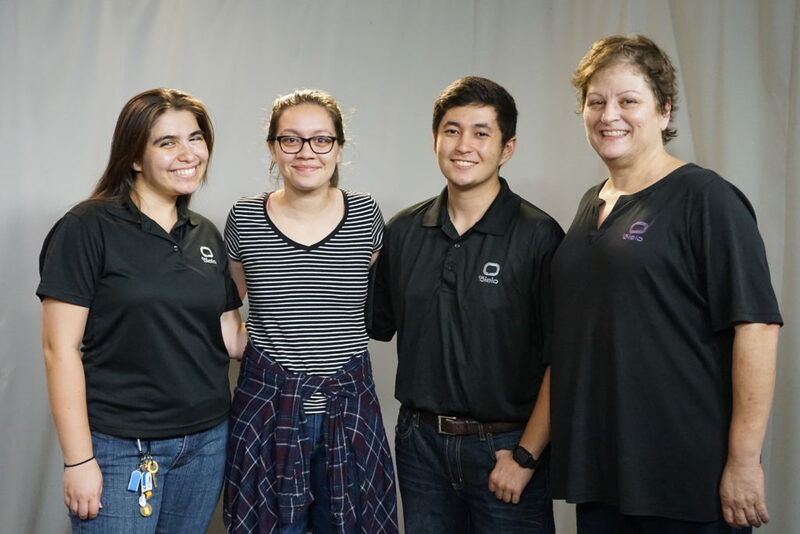 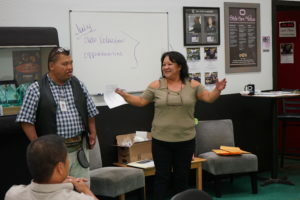 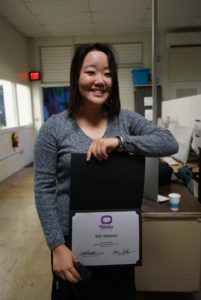 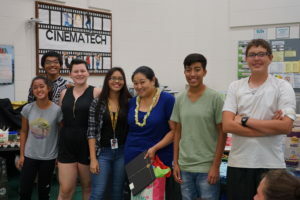 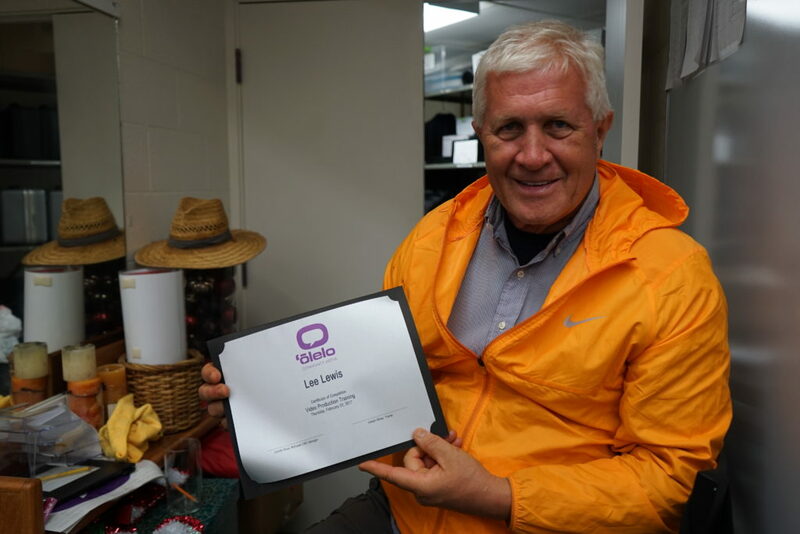 Attendees included recently certified Basic Production Class producers, students and mentors from Wahiawa’s Youth Xchange E3 After School Program, and other community members who frequent the media center. 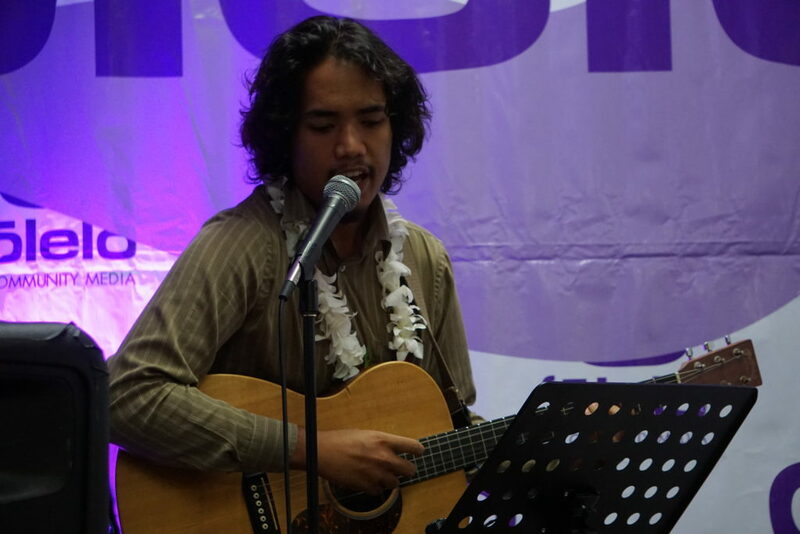 Overall, it was a fun gathering! 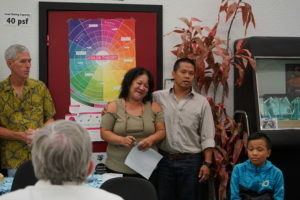 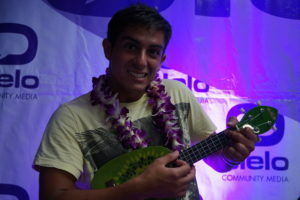 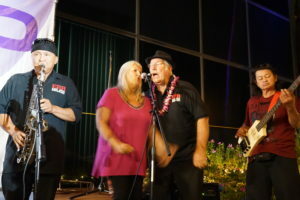 Mahalo to CMC Manager Jonette and Community Media Associates Joe Aikala and Brandyn Proctor for organizing this event. 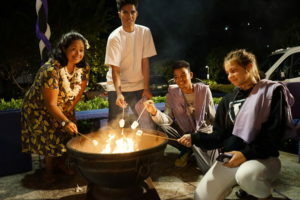 For more information on the Wahiawā CMC, call (808) 621-9727 or email us. What an amazing end of the summer at the Māpunapuna Community Media Center Kahea on August 10, 2017! 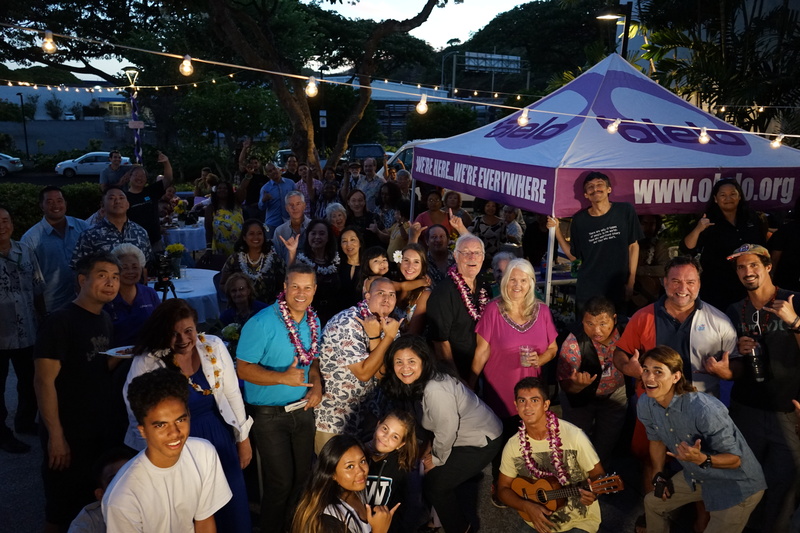 Over 50 clients, producers, and volunteers engaged in a fanciful feast and were treated to wonderful music by Pumehana Wadsworth, Brendan Korman, Jacob Roy, Buck Rodgers and the Easy Rock Bruddahs, Jai and Dan Duo, Ron Pohnel and The Executives, and Lokelani Pila! 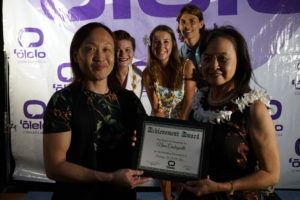 Congratulations to the following clients on receiving awards: Micah and Mason Tutuvanu for being exceptional volunteers and overall amazing ‘Ōlelo ambassadors, Kent & Elizabeth Kitagawa (Marriage on the Spot) for celebrating 10 years of the anniversary of their show, Nina Castagnetti (VN TV) for celebrating 20 years of community service, Herman Killi for the most volunteer hours (Māpunapuna CMC) accumulated in the second quarter of 2017, and Jim Brewer & Renee Ing (Full Democracy and News & Views), for celebrating 20 years of community service with ‘Ōlelo. 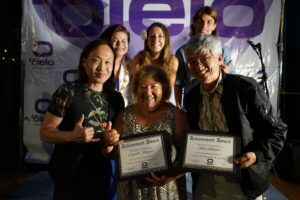 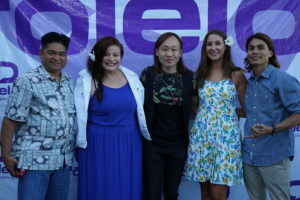 Mahalo to Community Media Manager Wayne Yun and Community Media Associates Keoni Alvarez, Corinne Makahilahila, Margaret Streb, and Edgar Sagayaga for a spectacular job of organizing this event. 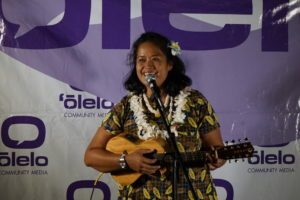 For more information on the Māpunapuna CMC, call (808) 237-2140 or email us.